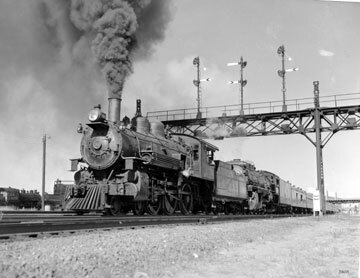 Western Pacific Railroad 94 is an oil-fired steam locomotive with a 4-6-0 wheel arrangement. The locomotive and tender are 69 feet long and weigh 293,500 pounds ready to work. Locomotive 94 was built by the American Locomotive Company, Brooks works, in September 1909. It is from Class 86, series 86 to 106. This class of locomotive was primarily used for passenger service. Technical Data: Built in 1909 by Alco-Brooks, shipped to WP 9/28/09, part of an order for 21 locomotives. Current Condition: Not operable, in need of extensive boiler work. The locomotive is maintained in long term storage in a climate controlled building.